Senior Cadets. Rejected for Territorials because of accident to hand. Height 5 feet 9 inches. Weight 133 lbs. Chest measurement 31-34 inches. Complexion dark. Eyes grey. Hair brown (dark). Sight - both eyes both 6/6. Hearing good. Colour vision correct. Limbs, chest well formed. Full & perfect movement of all joints. Heart, lungs normal. No illnesses. Free from hernia, varicose veins, haemorrhoids, inveterate or contagious skin disease. Varicocele - left side slight. Vaccinated. Good bodily & mental health. Slight defects but not sufficient to cause rejection. No fits. Loss of two terminal phalanges 2nd finger right hand. Loss of two terminal phlanges 3rd finger right hand. Loss of part of terminal tip of thumb right hand. Tyne Cot Cemetery, Zonnebeke, West-Vlaanderen, Belgium. First buried Polygon Wood; body reinterred in Tyne Cot Cemetery. Timaru Cemetery - memorial on parents' headstone. Robert John Porter was the eldest son of Christopher (Chris, Christy) and Martha (née Fair) Porter, of 6 Gibson St, Timaru. Born on 27 March 1897 at Belfast, Northern Ireland, he had been in New Zealand for 11-12 years when he enlisted in 1917. In 1901 young Robert and his parents were at Windsor, County Antrim, Ireland. Robert had attended Balmoral School, Belfast, Ireland before he was admitted to St Albans School, Christchurch, New Zealand in 1905. From there he went to Timaru in May 1906. The family was well settled in Timaru by 1909 when Robert’s sister Gladys entered Timaru Main School. It is not clear whether this Robert Porter is the student who, in the Education Department’s examinations held on 30 November and 1 December 1911, qualified for a Junior Free Place in the secondary and technical schools. His father was a carpenter, an occupation which Robert followed. On enlisting, he was employed as a carpenter for the Canterbury Education Board in Timaru. Private R. J. Porter enlisted on 27 February 1917, a month before his twentieth birthday, although he gave his age as 20. He was single, of Church of England affiliation, and physically fit. He had served with the Senior Cadets, and had been rejected for the Territorials because of an accident to his hand. He was in good condition, apart from part of the second and third fingers and thumb on his right hand. This defect was not such as to cause rejection. The South Canterbury quota of the 29th Reinforcements was to have left Timaru in early May 1917, but owing to transport trouble the men left at short notice on 30 April and proceeded to camp. He embarked on 16 July 1917, with the New Zealand Rifle Brigade, per the Athenic, destined for Liverpool, England. Having joined the Otago Regiment, on 26 October 1917 he proceeded from Sling to overseas duty in France. It was not long before the bad news came – in mid December 1917 news of Robert John Porter’s death in action was received by his father, Mr C. Porter, of Otipua Road. It was noted that he had been educated at the Timaru Main School and then taken up carpentry. Just a few days later the Timaru Herald reported his sister Kathleen’s success at school – such contrasting news for the family. Private Porter was killed in action on 24 November 1917 at Ypres, Belgium, after just a month in the Field. He was one of over 100 fallen or missing men recorded in Casualty List 740 issued on 13 December. “Robert John Porter, the beloved eldest son of Christopher and Martha Porter, Otipua Road, Timaru; aged 20½ years” was killed in action “Somewhere in France”. At the meeting of the Timaru Main School Committee held on 19 December 1917 reported that since the previous meeting, two old boys had been killed at the front – Robert J. Porter and Norman Wallace. A vote of sympathy was passed with the relatives of the old boys who had laid down their lives on the battlefield. Robert was remembered again at the Timaru Main School, when the chairman at the annual meeting on 22 April 1918 proposed a vote of sympathy with the parents and relatives of ex-pupils who had fallen in the war. This was carried by silent vote, all present standing in honour of the 25 ex-pupils who had died in the past year. A copy of his Pay Book Will, dated 6 November 1917 (just 18 days before his death), was received. Were things not good? Did Robert have a premonition? He bequeathed all his property, both real and personal, to his mother. His medals - British War Medal and Victory Medal – were sent to his mother, Mrs Martha Porter, Trafalgar Street, in 1921. By 30 November 1923, Mrs Porter had moved to Gibson Street, Timaru. He was also eligible for the memorial plaque and scroll which were duly sent. There is a memorial on his parents’ headstone in the Timaru Cemetery. Christopher and Martha spent the rest of their lives in Timaru. Christopher Porter, then assistant architect to the Education Board, died very suddenly in 1931, Martha lived on till 1955. His name is inscribed on the Timaru Memorial Wall and on the St Mary’s Anglican Church, Timaru, Memorial. Planning for the St Mary’s memorial was underway in 1920. Although the Thank-offering fund, inaugurated in November 1919, had not met with great support, £141.6s.6d. was earmarked for the war memorial and designs were being prepared for a handsome mural tablet for the church as a memorial to the members of the parish who had given their lives for their country in the great war. In September 1920, Archdeacon Jacob published a list of parishioners who died on active service, as he was concerned to see that the names on the proposed memorial were correct and complete. The name of R. J. Porter must have been an addition to that list. 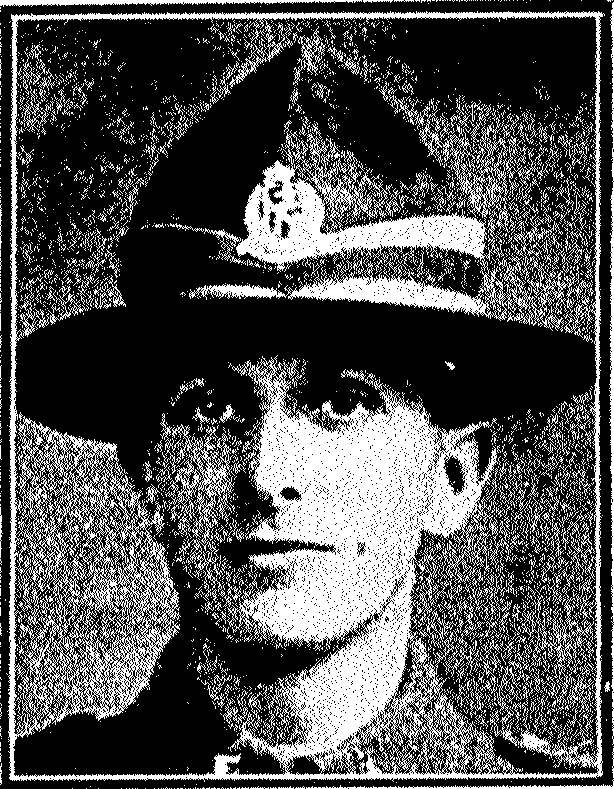 A photograph of Private Robert J. Porter (Timaru) was printed in the Otago Witness of 2 January 1918.